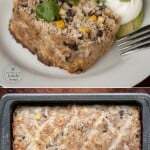 Southwestern Turkey Meatloaf is an easy and healthy family dinner recipe. This ground turkey meatloaf is packed with protein and flavor! Black beans, green chile, corn, Mexican cheese, tortilla chips, and spices like chili powder and cumin give this filling recipe that Southwest flavor you crave. Not gonna lie. When we make meatloaf, we almost always make the absolute best meatloaf recipe which has been in our family for years. You know, the kind with ground beef, a rich flavorful sauce on top, and flavor that reminds you of the family dinners you enjoyed as a kid. I’m not a huge ground turkey fan. The only time I’ve ever used ground turkey and actually liked it was when I made my spicy turkey burgers, and oh boy those were amazing because of a secret ingredient. Occasionally, I like to try out healthier alternatives and I know ground turkey is not only lean and full of protein, but it’s pretty inexpensive too. I also find ground turkey rather bland on its own, so I added a ton of flavor and texture by mixing in things like crushed chips (or stale taco shells in my case), corn, black beans, green chile, and corn. This easy turkey meatloaf is so flavorful and tasty that you’ll be wanting to make it for dinner every week! How long does it take to cook a turkey meatloaf? I had no idea how long to cook this thing, so I inserted my handy digital thermometer and took it out of the oven at the optimal temperature which was when it was cooked and safe to eat, yet moist and not dried out. WIN. 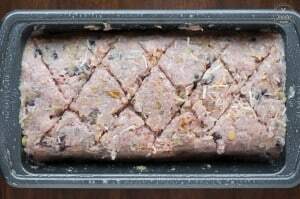 Overall, you should cook your ground turkey meatloaf for around 55-60 minutes until the internal temperature reaches 165 degrees F.
What is in the best Turkey Meatloaf recipe? To make the best turkey meatloaf E-V-E-R, you will need several ingredients. You will start with ground turkey breast and ground turkey dark meat. 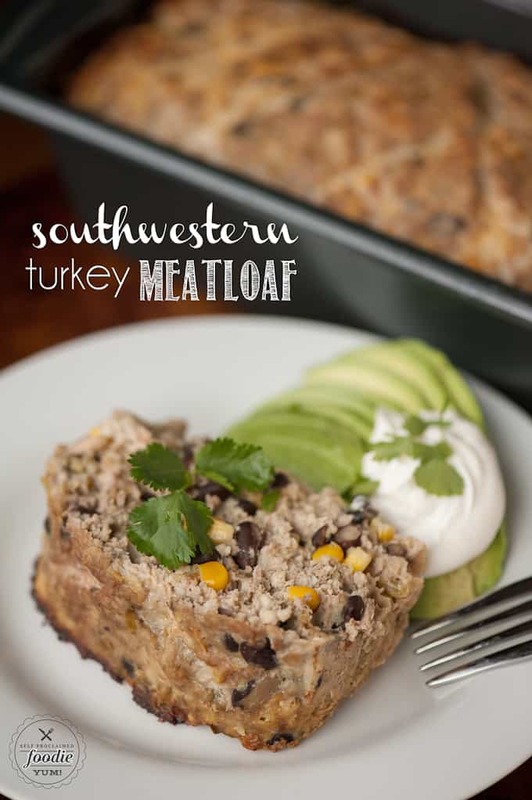 Then, to add a delicious flavor and texture to your southwest meatloaf, you will will add tortilla chips or taco shells, black beans, green chile, frozen corn, an egg, cheese, cumin, chili powder, and salt. Altogether, these ingredients will make up the best homemade southwestern turkey meatloaf you have ever had! 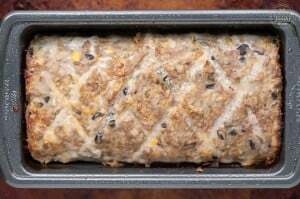 To make the best turkey meatloaf ever, you will need prep your oven and spray your loaf pan with cooking spray. The prep for this meatloaf recipe is super easy, you just mix all of your ingredients in a large bowl until they are well combined. Afterwards, you will add it to the loaf pan and make it into the shape of a loaf. Next, cut a diagonal pattern into the top of the loaf. 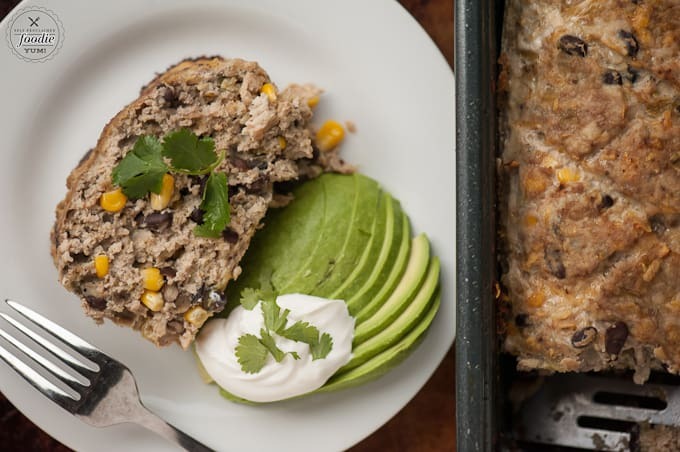 Just like it is said above, you will need to cook the meatloaf for around 55-60 minutes until the internal temperature of the loaf reaches 165 degrees F.
I simply served this up with some avocado and sour cream and it was fantastic. I even took a piece of the cold leftovers and ate it for lunch the next day with a green salad and some fresh citrus cumin vinaigrette. You should try it! 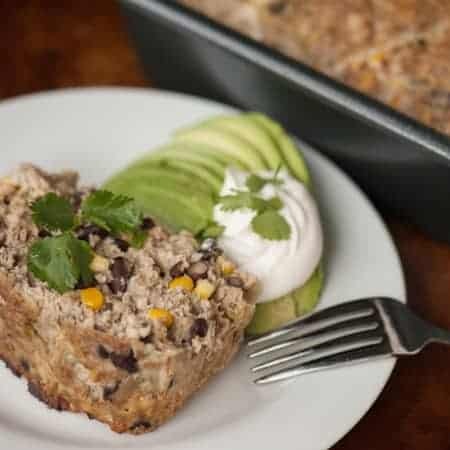 If you're looking for a new family dinner idea, this Southwestern Turkey Meatloaf is packed with protein and flavor and is super easy to make. Preheat oven to 350 degrees F. Spray loaf pan with cooking spray. Mix all ingredients in large bowl. Add to loaf pan and shape into a loaf, cutting a diagonal pattern into the top with a sharp knife. Cook in preheated oven for 55-60 minutes until the internal temperature reaches 165 degrees F.
Serve hot with avocado, sour cream, and/or salsa or serve cold on a sandwich or in a salad. This post was originally created in February 2016 and has been updated with more fun facts and tidbits for your reading pleasure.